What happens to your commercial food product? 1 As part of our food waste collection service, we collect all non-animal by-product food products directly from you. 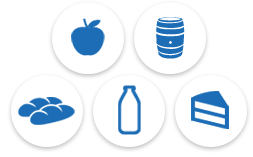 2 We process these waste foods at one of our regionally-based food waste recycling facilities. 3 The result is a high-quality alternative animal feeds. 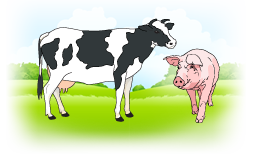 Find out more about our animal feeds for farms. How does the surplus food to animal feed process work? In converting surplus commercial food to animal feed, we accept products from the human food-chain. We're particularly interested in your product if your facility has an excess of production, breakdowns, or stock clearances that need to be disposed of. If your food cannot be used for its intended purpose we can be of service! 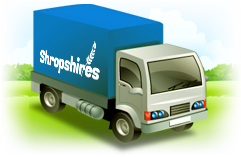 Shropshires is geographically placed to provide service coverage across mainland UK. We will provide bespoke on-site handling equipment to suit your individual needs, and our fleet of articulated vehicles allows us to maximise payloads and minimise transport miles. Shropshires is serious about its responsibilities and commitments as an animal feed supplier, being accredited by FEMAS which is a UKAS-regulated scheme. It is a HACCAP-based system, which will dovetail into your own organisation's programme. We are also a founder member of the UKFFPA, which is supported by the Food Standards Agency. Why should you choose to work in partnership with Shropshires? 'Origin' system to help reduce production issues. We operate our own accredited processing facilities. We provide online Health & Safety training for our clients. Does your business have commercial food that needs to be disposed of? If so we'd love to hear from you as we can probably recycle it. Please call us or request a call-back to discuss with our team.